When the Gastronomy guide for the 2013 Melbourne Food and Wine Festival arrived in my letter box, the timing could not have been better. We were just about to leave for Hawaii and seeing Ed Kenney’s name featured in the ‘Earth MasterClass’ section, (Huxtable are bringing him out for the event) reminded me that I needed to book dinner at his restaurant ‘Town‘, in Honolulu. A couple of tweets and a 10 hour plane flight later, we turned up on Town’s doorstep, to a super warm Hawaii welcome from Ed, and settled in to read a menu full of ingredients I’d never heard of. Town, which has multiple accolades and awards to its name, is renowned for utilising local produce and promoting indigenous ingredients. Ed is not only passionate about the food he serves, but where it comes from. He is on the Board of Directors for MA’O Organic Farms, Kokua Hawaii Foundation & Sustain Hawaii. His philosophy is that “Food is the unifying fabric of humanity, connecting us to the earth and each other.” Word. I quickly decided the way to get the most out of this visit was to ask Ed to feed us his favourite dishes until we fell into a food coma, and he was only too happy to oblige. 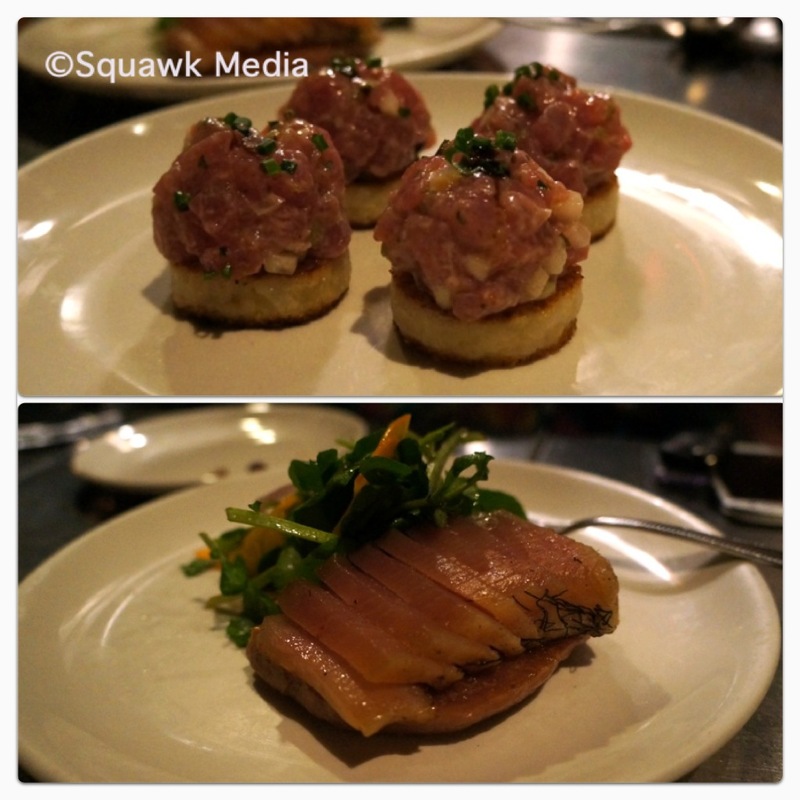 He started us off with the ahi (Hawaiian tuna) tartare served on a risotto cake, with balsamic vinegar, which was superb, both in texture and flavour, and came at us soon after with the cured opah (Moonfish) with pa’ i’ ai (made from taro root), watercress and persimmon which all worked beautifully together. Our extremely sweet and friendly waitress Randi patiently explained each ingredient to us and answered my incessant questions throughout the meal. 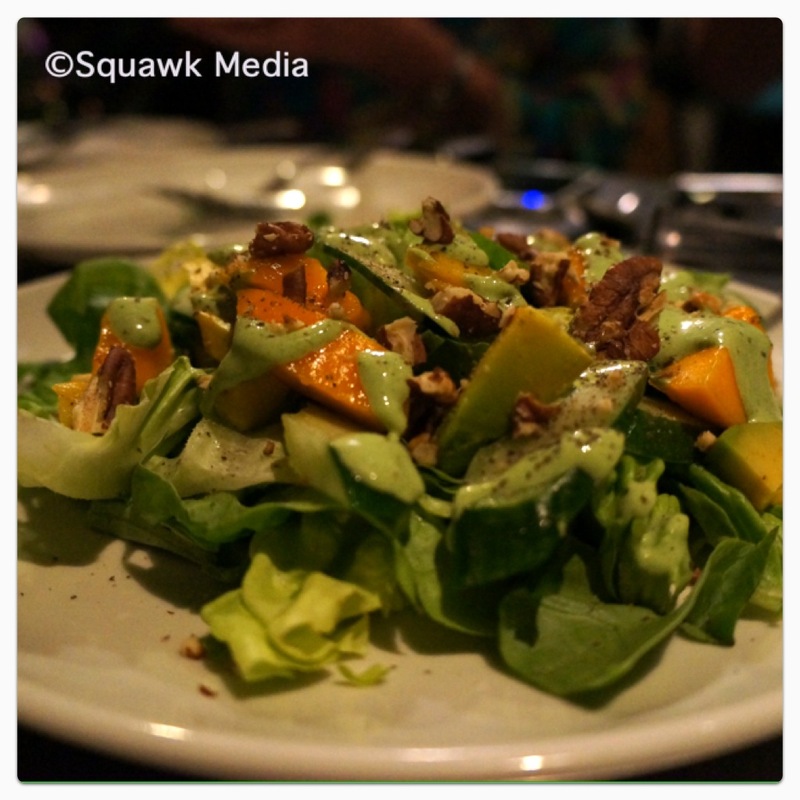 The salad came full of avocado, papaya, butter lettuce, pecans, and cucumber, and was served with a ‘green goddess’ dressing (apparently a West Coast US staple but again something I’d never heard of, typically containing a range of fragrant herbs, spring onions and mayonnaise or similar). I’m offically a fan. 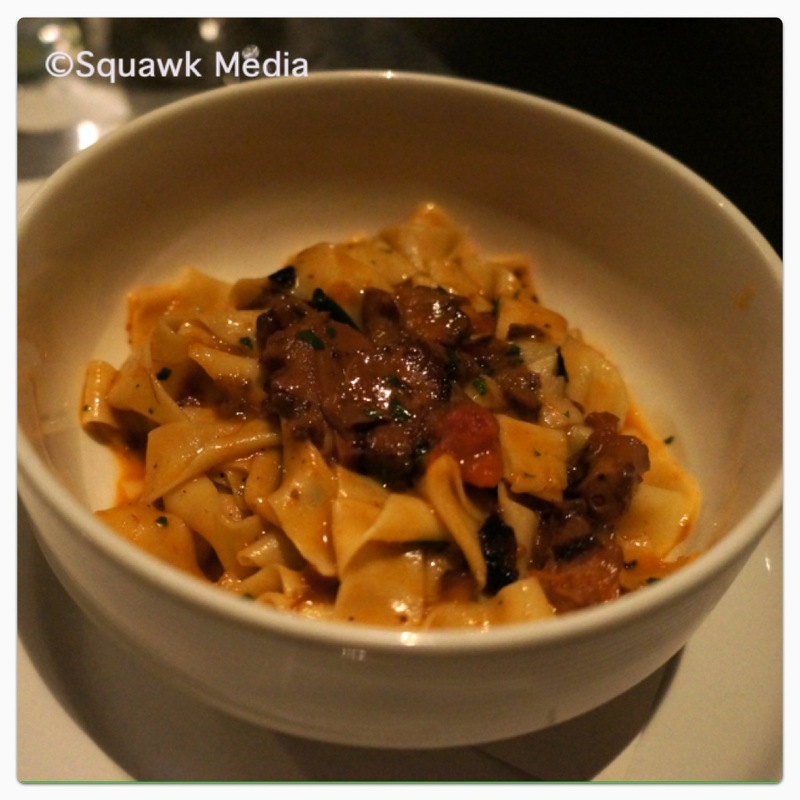 We also tried the hand-cut pasta, which was served with a south shore he’e (octopus) ragu, and it was a knockout. I probably wouldn’t have ordered this if I’d known what it was, simply because I couldn’t imagine how you could execute it – more fool me and lucky I wasn’t in charge of the food selection, because this was one gorgeous, rich, hearty bowl of goodness. Slightly salty, beautifully textured with silken ribbons of perfect pasta. 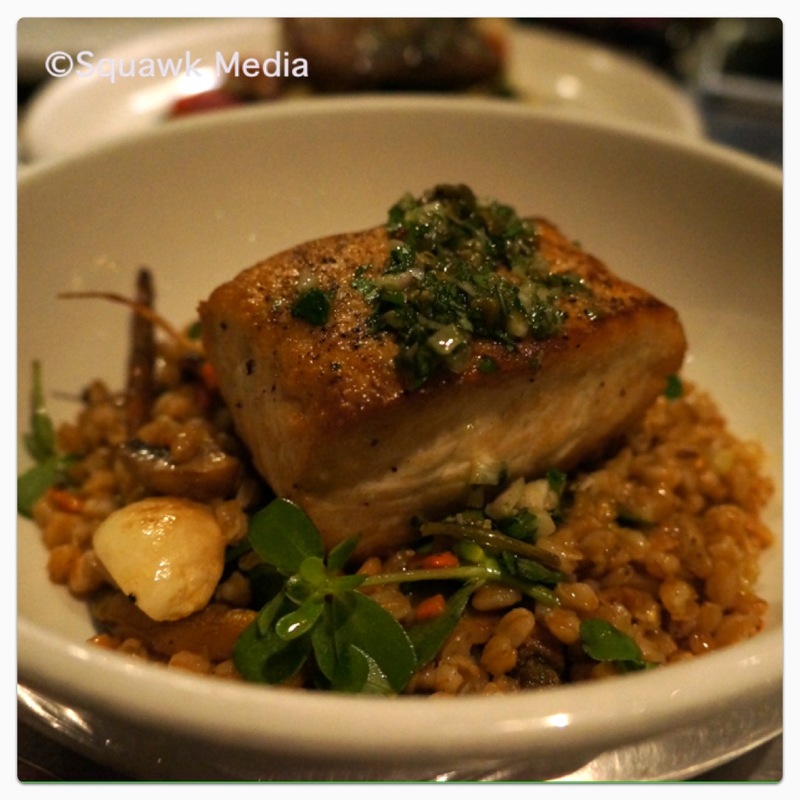 We then had some more opah, this time served with farro, roasted root vegetables, purslane and salsa verde which was moist, sweet and delicious, as was the mahi mahi dish, served with local veggies, limu (Hawaiian algae) and meyer lemon. Then came the extremely sensational shinsato pork chop, served with an ulu (breadfruit) mash and bitter greens. I was only a little mad with Ed that he’d left this til last when I was already getting full because this was some of the best pork I have ever eaten IN MY LIFE. 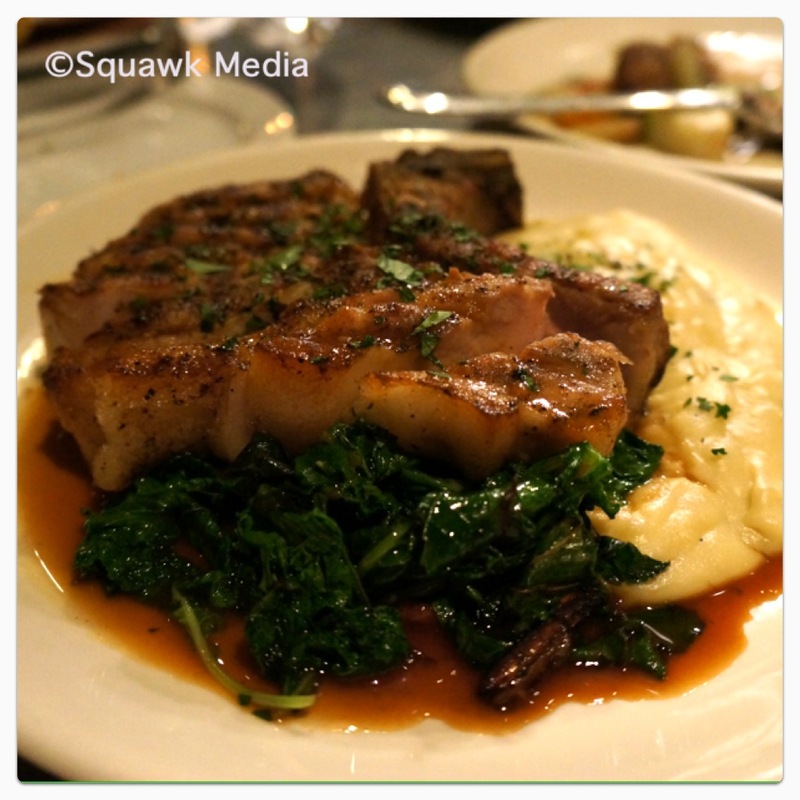 Juicy, tender, with incredible flavour, and the breadfruit mash was like velvet. Oh my. I needed a little rest, and another glass of wine whilst contemplating how I would finish this plate. (I privately congratulated myself at this point for wearing a loose-fitting dress). But finish it I did (I had help), and then it was on to dessert – obviously utilising my altogether separate ‘dessert stomach’ to fit this in. The meal lost none of its momentum in the ‘wow’ stakes when it came to the dessert. 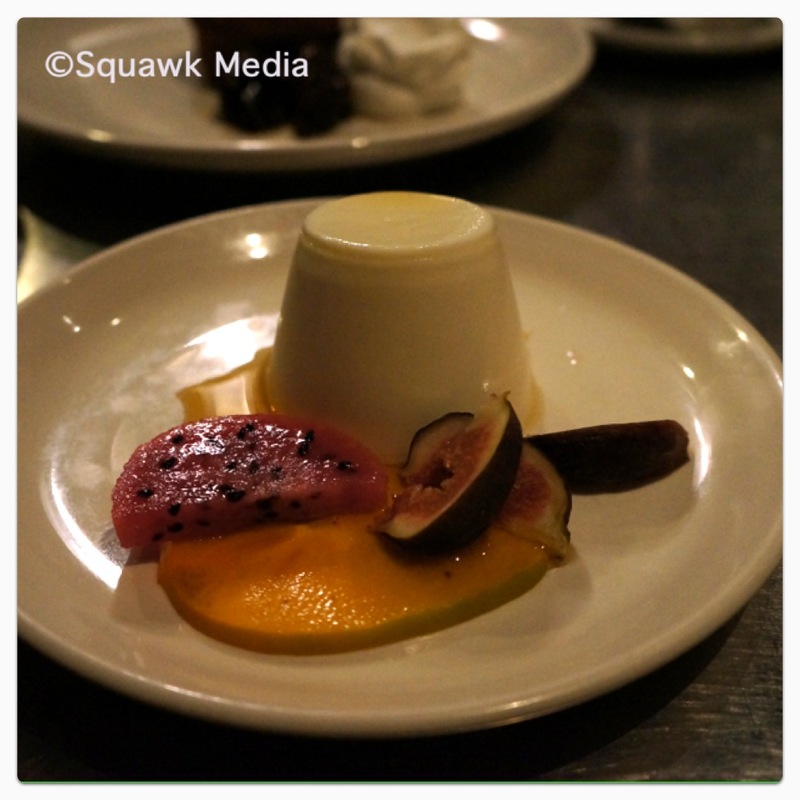 We were spoiled with 3 different dishes – the beautiful satiny buttermilk pannacotta was first, made with local nalo meli honey and served with fresh tropical fruit, and some figs from the tree right outside the restaurant. 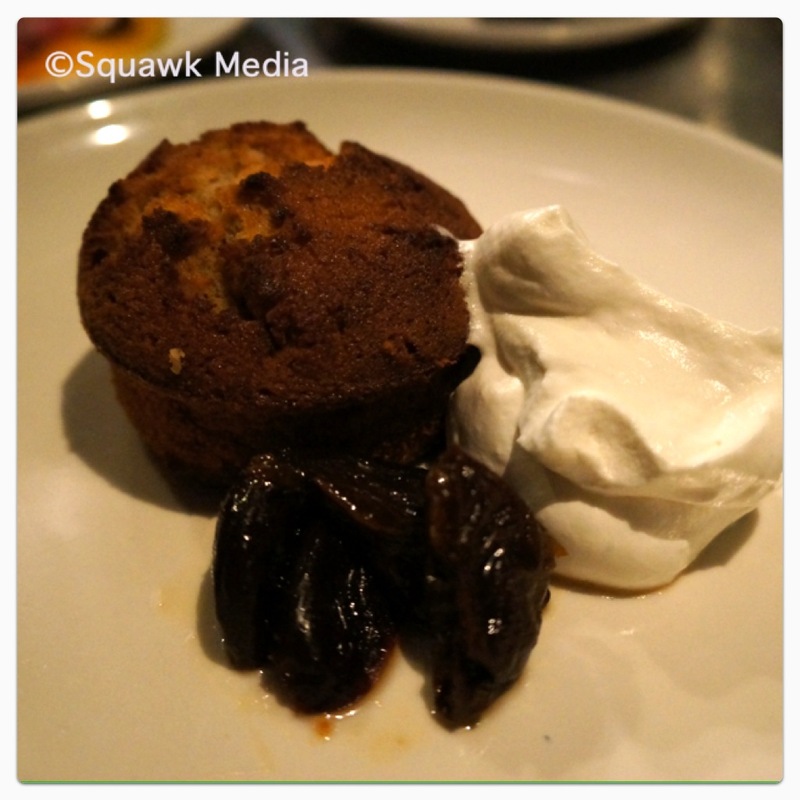 We then tried the ‘financier’ (from the friand family of French baked goods) made with browned butter and almond meal, and served with prunes which had been stewed in Earl Grey tea, and some whipped creme fraiche. I’m still dreaming about this fluffy treasure 3 weeks later. 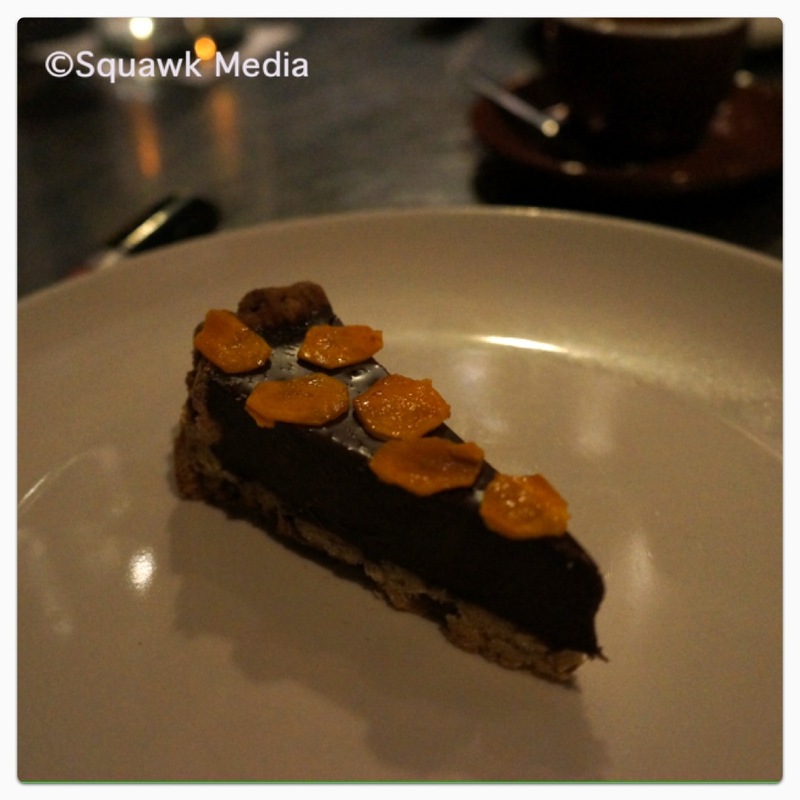 The piece de resistance for me however, being a self-confessed chocoholic, was the stunning salted dark chocolate pretzel tart which had wafer-thin slices of candied tumeric on top. The tart base was made up of crushed pretzels, offering its saltiness as the perfect foil to the rich, smooth dark chocolate filling. The tumeric was hot and sweet all at once and it just rocked. This was a flavour explosion of the highest order and one of the best things I have ever put in my cake hole. 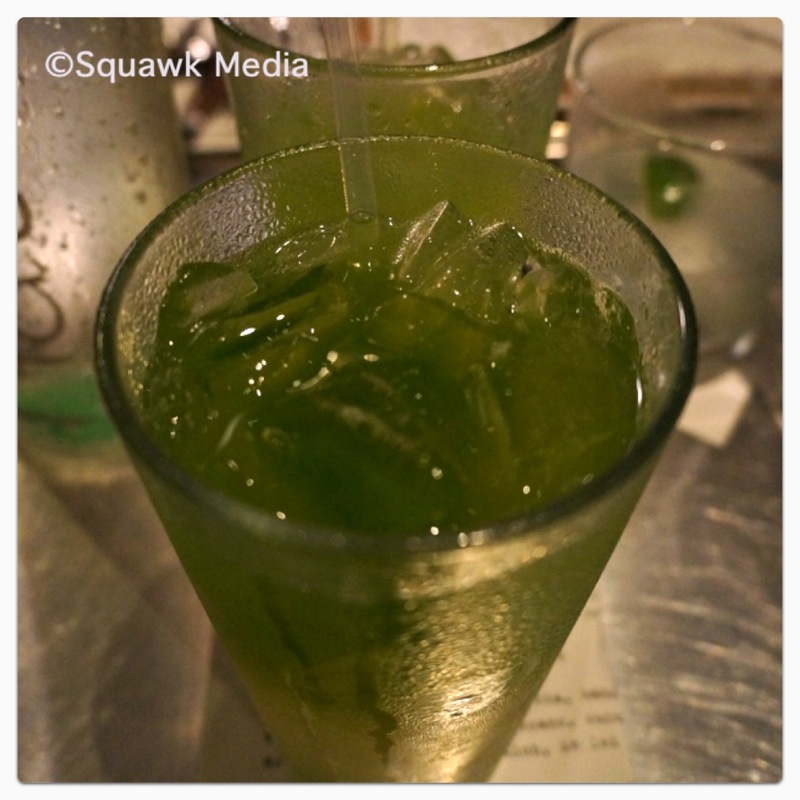 I cannot rate this restaurant highly enough, and it was truly one of the highlights of our visit to Hawaii. The hospitality at most of the places we ate was excellent but Town’s waitress Randi took it to a whole new level of awesome, to the point where when we left we were hugging her goodbye. For me, Town feels like that place that no matter who you are, or where you come from, you’ll feel right at home. And I can’t wait for Ed Kenney to come Down Under in March 2013 so we can return the favour, take him out and show him our town. “Local first, organic whenever possible, with Aloha always”. Amen.